A manufacturer who makes unique goods — or batches of goods — to order usually uses a job order cost system to determine how much each job costs to make. Such goods may include custom teddy bears, made-to-order suits or aircraft, catered affairs, or new feature films; the individual units or batches are called jobs. In job order costing, an information system traces the exact value of raw materials put into process and the value of direct labor and overhead used to transform those raw materials into finished goods. This information system ensures that the company accounts for all direct materials, direct labor, and overhead costs and accumulates the cost of each job. Job order costing uses a few specific forms to keep track of the resources that go into an individual job: a job order cost sheet, materials requisition forms, and time tickets. To keep track of jobs, companies typically use a form called a job order cost sheet. The job order cost sheet accumulates all the direct materials, direct labor, and overhead costs applied to that job. This form is usually kept with the job itself, so that any additional costs incurred can be documented quickly. When factory personnel need raw materials, they complete a materials requisition slip. This form kick-starts the manufacturing process so that the factory can begin to work on the raw materials needed to make the goods. In this case, storage personnel issued ten cases of plastic pellets, stock number AA45, to the Assembly Department. These cases cost $300 each, totaling $3,000. 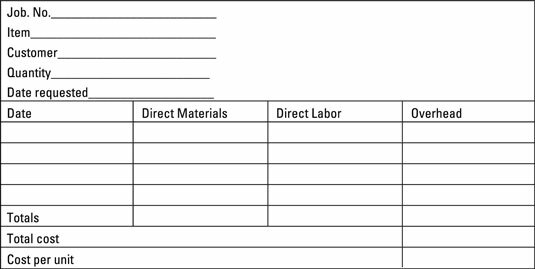 After they put the goods into production, factory workers copy the cost of the materials listed on the materials requisition slip on to the job order cost sheet. They keep the two forms together, usually with the job itself. As employees work, they complete time tickets to indicate how much time they spend working on each job. This time ticket indicates that Jon Garfunkel worked on Job 1245 for two hours. This direct labor adds $40 to the cost of this job. At the beginning of the period, add up projections of indirect materials, indirect labor, and all product costs not included in direct materials and direct labor. For purposes of Job 1245, assume that the company incurred $10,000 worth of overhead overall. Identify one or more cost drivers. Find measures that drive your overhead. Many companies assume that direct labor drives all overhead. Here, assume that the company uses a single overhead cost pool, with direct labor hours as the cost driver. Compute the overhead allocation rate for each cost pool. To compute the overhead allocation rates, divide total overhead in each cost pool by its cost driver. Note that, in this case, employees in the company are projected to work 5,000 direct labor hours this year. Multiply the cost pool’s overhead allocation rate by each job’s cost driver. So far, employees worked two hours on Job 1245. Therefore, this job would absorb $4 worth of overhead (2.0 hours x $2 per hour). 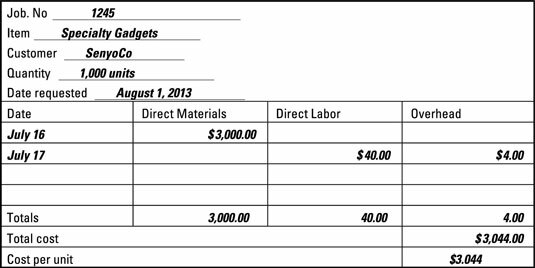 The materials-requisition, time-ticket, and overhead-allocation information all goes on the job order cost sheet. To determine the total cost of the completed job, employees simply add up the job order cost sheet.